Don’t you just love it when you get something done? 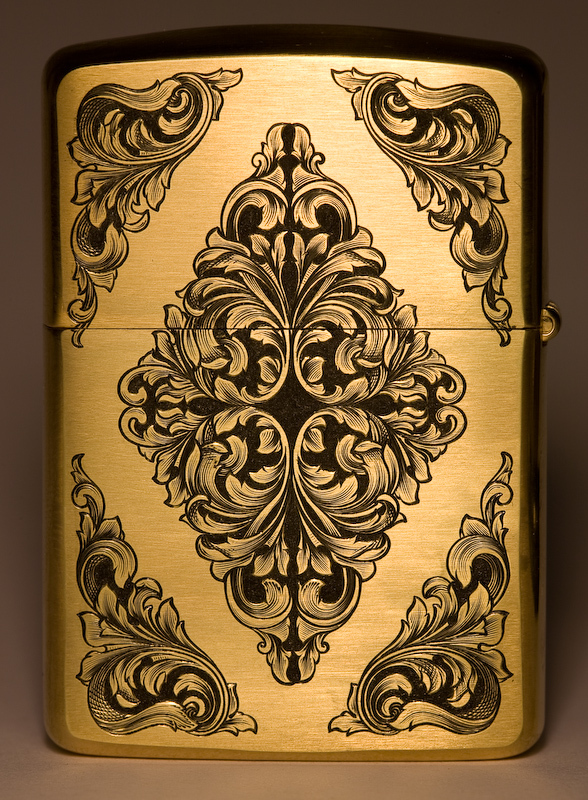 Past few weeks I’ve been working on a Zippo engraving for a customer. My first idea was to make it rather simple design, but that sort of didn’t work out. This is first of the ‘replicated pattern’ type of engraving I’ve done, at least on this level. One I made a mirrored design engraving, but I think this one is an improvement over the old one. Anyways, that engraving is now completed. 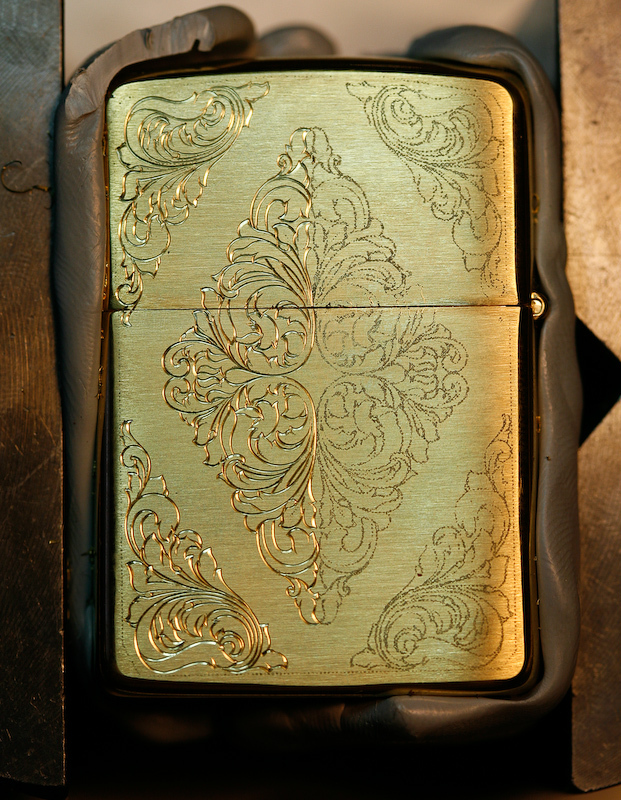 Here are few photos of engraving in progress. 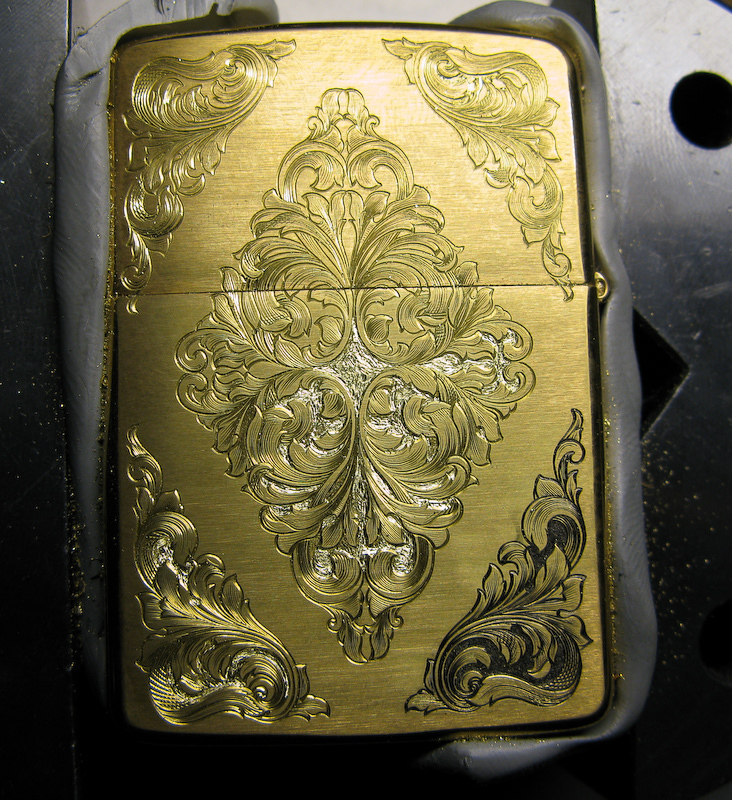 Zippo engraving in progress, half of the contours done. In this stage the lower right corner is completely finished (I just wanted to see how the final result will look like, impatient as I am), all the shading is done and some of the background is removed (the more shiny spots). And here it is, completely finished. Design took about 8 hours (I’m still very slow at it) and engraving 13 hours. So, what do y’all think about it? Very nice! With what You ink those? Sometimes I use Hammerite black paint, but this time I used permanent pen (those that are used to write on CD’s). First I color the whole thing and then rub off the excess with finger. Very nice job! Shows well against the gold case. I know that you were a programmer moving into a new profession and it certianly seems that you are excellent at the new line of work. How did you get started engraving? Did you take any classes? What type of equipment do you use? I started engraving when the knives I made needed some embellishment :). And after trying for some time on my own I took 1-week GRS basic class from Sam Alfano and it really helped. For equipment I use Lindsay Classic graver with PalmControl, a very nice tool. my friend.. ur a true master.. doesn’t it feel really bad having to sell your own art? if only we all had enough money that we wont be loosing our works to strangers… and never get to see it again… anyway, may i ask, around how much are you selling these designs? you can email me about that…are you interested in other people’s design? Nice work, good luck with your progress. Check out some of the engraved knives on my website; http://knifeologycustomknives.com/ you will know some of the engravers. I’m quite impressed by your job. Nice ! Is there some place to find acanthus drawings like yours ? Thanks Vil, many thanks. BTW do you use graver with hammer or micropulse one ? I’m trying to replicate your lighter, can i send you pics after ? I use that pulsing one, air powered. Sure, you can send me pics. Viljo Marrandi :I use that pulsing one, air powered. Sure, you can send me pics. Hi Vil, here http://www.handengravingforum.com/showthread.php?t=4148 the pics of my attempt of CNC copy of your wonderful lighter.